Whatever your moving needs may be, Meathead Movers will help you feel at home in Millbrae. Our professionally trained student-athlete movers and our moving concierge will be with you for the entirety of your move to Millbrae. Welcome to Meathead Movers of Millbrae! If you are moving to or from anywhere in Millbrae, we are the moving company for you! Our professionally trained student-athlete movers and our moving concierge service are here to help you with every stage of your move in Millbrae. Located just 15 miles south of San Francisco on the Peninsula and nestled between rolling hills and scenic San Francisco Bay, Millbrae is a beautiful city to call home. Its convenient location and BART/Cal Train Stations, make almost any part of the bay just a short commute away especially hotspots like San Francisco and Silicon Valley. It’s ideal location, has made it a great place for commuters and young families to settle down. 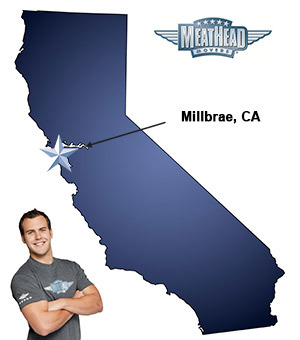 If you are considering making your new home in Millbrae, Meathead Movers is here to help. Our moving company specializes in local, long-distance, and commercial moves to, from, and within Millbrae. We also provide reliable packing, storage, on-site relocations, and our distinctive moving concierge service, which connects you with local service providers. All our student-athlete movers are thoroughly screened and trained before their first move. With branches not just in Millbrae, but all throughout California, we are your one-stop resource for all your moving needs, no matter where your California move takes you. We have been revolutionizing the moving industry since 1997. When you entrust your move to Meathead, you can rest assured knowing that your move will be a success because our professionally trained student-athlete movers are the best movers the industry has to offer. In fact, you can see what your neighbors in Millbrae have to say about us. With our 100% satisfaction guarantee, the only thing you have to lose is the stress that comes from moving! So contact us today for a free no-obligation moving quote and to learn how we can help you on your next move! Moving to Millbrae? Here are some helpful resources.